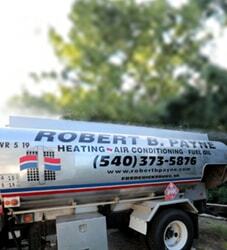 Expert Air Conditioner Installation Fredericksburg, VA | Robert B. Payne, Inc. When your home or business simply is not getting cool enough, you may be considering contacting a repair technician. 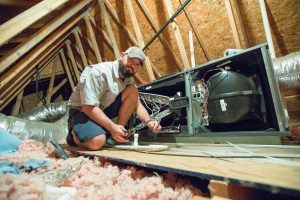 Depending on your HVAC system, it may actually be a better investment to choose new air conditioner installation in Fredericksburg. Our HVAC contractors are familiar with all the benefits of upgrading to a high-efficiency model and can make recommendations as to which air conditioner replacement is best for your space. If you’d like to increase the comfort of your employees or prospective customers, don’t waste any time in having an air conditioning system professionally installed. Without a functioning air conditioner, a heat wave could easily halt your business. The installation of a large commercial system is certainly not a do-it-yourself type of job. It requires an unbelievable amount of work – work that only professionals can execute properly. At Robert B. Payne, Inc. we hire expert technicians with years of experience in the industry, and have a strong commitment to continued education and advanced training. We do this because we know that your business relies on the air conditioning services we provide. All of our customers receive our quality guarantee. We also price our services competitively, to ensure that you receive the most value for your money. To prevent extensive repairs or poor operation, have your system professionally installed. As temperatures rise, more and more people avoid going outside. Instead, we hole up indoors and enjoy the comfort of a refreshing air conditioning system. Of course, in homes without air conditioners, stress and discomfort can run rampant. An overhead fan can help move the air around, but it doesn’t create the same refreshing environment. At Robert B. Payne, Inc., we don’t just repair air conditioners, we also professionally install them. If you opt for an amateur installation, you’ll pay later in repairs and rewiring. 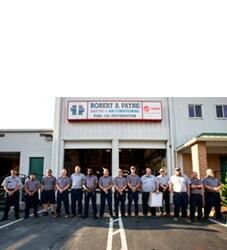 At Robert B. Payne, Inc., on the other hand, we only work with experienced, thoroughly trained technicians. Each installation expert we have on staff is equipped with the latest industry tools and is prepared for any job. We’ll make sure your unit functions perfectly before we leave you to your comfortable home. Ductless air conditioning systems are known for their exceptional efficiency, flexibility, and smooth, nearly silent operation. Without the restrictions of a heavy duct system, the system can deliver conditioned air into any space through small, unobtrusive wall or ceiling units. Furthermore, by eliminating the air distribution system entirely, you effectively reduce the amount of system maintenance and repairs. This, in turn, will save you money. Of course, as with any heating or air conditioning appliance, it’s important to have your ductless air conditioning system professionally installed. Homeowners do not have the expertise required to properly install the system. Any attempt to complete the job on your own may lead to additional expenses and costly repair services. It’s best to have Robert B. Payne, Inc. install your new, efficient system correctly the first time. 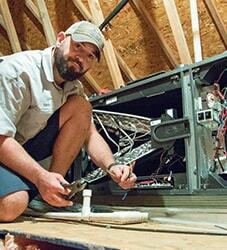 When it comes to installing a split system, you want a trained professional on the job. While there’s no ductwork involved in the system, it still has many confusing internal parts. Installation is certainly not a do-it-yourself job. At Robert B. Payne, Inc., we can professionally install a new split system in your home. We’ll make sure everything’s working as it should and quickly troubleshoot any problem before we leave. We’re dedicated to customer satisfaction and premium quality. There are many reasons to get a split system air conditioning unit. For one thing, these units are more energy efficient and cost-effective than their traditional counterparts. In fact, mini split systems are 40% more efficient than window air conditioners. This summer, get Robert B. Payne, Inc. to install a more cost-effective system in your home! More and more homeowners are opting for central air conditioning units. These systems are more efficient and effective at cooling an entire home than window units, which work best on only a single room. The size of unit you’ll need will depend on the size of your home. That’s where Robert B. Payne, Inc. enters the picture. We not only offer professional installations, but also help homeowners and businesses select the right unit for their needs. In order for your unit to run at maximum efficiency, we recommend regular maintenance. Our team can assess where your HVAC is now in terms of efficiency, so you can determine if new air conditioner installation is the best choice. Our services come with outstanding warranties on top of the industry-leading products we are qualified to carry. Once your unit is installed, we also offer excellent maintenance programs to keep it in good shape year-round. How much does a new air conditioning unit cost to install? This is one of our most common questions, and honestly, it’s a little difficult to answer. That’s because every home is different, and until one of our technicians arrives at your home, it’s hard to determine exactly how much it will cost to install a new air conditioner. One of the primary costs will be for the unit itself. If we are supplying it for you, then you will have to pay for it. Our technicians will also come to your home with plenty of additional ductwork in case it is needed. We will also charge an installation fee for our technicians, depending on how how big your home is, how many installation parts we use, and how much time it takes to do the job. But no matter what, we will give you a price before we start the work, guarantee the price, and guarantee the work. There will be no surprise bill, ever! When you feel that cool breeze flowing around your home on a hot summer day, the cost will be worth it. You’ll feel refreshed and ready for the day in your air conditioned home. If you aren’t sure if you are in need of air conditioner installation in Fredericksburg, simply get in touch with our team at Robert B. Payne, Inc. We have more than 80 years of experience in the industry, and can help you make the right decision when it comes to cooling your home or business. To get started with an estimate or request for service, fill out our online contact form or call us at (540) 373-5876.